First weekend in Tucson! This is paradise! I have not been to the Tucson gem and mineral shows for four years, and it is so great to be here. My first weekend in Tucson, and I have already blown my budget. The weather is perfect, and waking up with the views of the mountains is spectacular. The colors here are so different than those on the East coast. I am mentally matching bead color numbers with the purples and greens I see. The best part is seeing old friends and making new ones. I spent an hour at Sandy Schor’s booth looking at his incredible collection of antique jewelry, and I bought myself a micromosaic smalti filati button. I have wanted this style of micromosaic for many years and can now cross that off my list. Tucson is really a combination of many different gem, mineral, bead, jewelry, and art shows -- and they all bustle. The micromosaic smalti filati I purchased in Tucson. I love the colors of the Southwest. Good morning, Tucson! The best part about Tucson, of course, is seeing friends new and old -- including, here, Julie, Rae, and Sarah! Okay, serious question… and be honest. What is the best part of sewing handmade goodies for babies and kids? Picking out the fabrics, of course! From there, it’s pretty much all downhill: cutting patterns, pinning, sewing, repinning, pressing, and, finally, worrying about the fit. Wouldn’t it be great if you could pick the fabrics and then let someone else do the work? Just Ducky offers just that: American-made, custom children’s clothing perfect for your little one. And you get to pick the fabric… plus a bunch of other fun options, too! Based in our neck of the woods here in Western North Carolina, Just Ducky has been creating custom clothing for kids since the early 80s. They’re currently celebrating the release of their spring 2012 line, a collection of new designs and new fabrics to choose from. Available in a few select retail stores in the Asheville, Just Ducky does most of their work through home shows: think trunk show in a cozy environment, good company, and fun with fabric. And you’re invited! Want to find a home show in your area? Click here. Or maybe you’re interested in hosting your own Just Ducky home show? Click here. January is THE big month for nuptial planning with a lot of the major magazines, promotions, and events sending brides off into a wedding day game plan frenzy. We’re embracing the spirit here at Lark Crafts as you can see from our recent posts on Jewelry Bridal Bouquets and a fabulous roundup of gorgeous wedding Etsy Finds. And with Valentine’s Day just around the corner, who among us can resist the embrace of love and commitment? I’ve spent some time digging around the depths of the online wedding world to offer up to you a list of some of the best wedding blogs out there, all jam-packed with ideas for everything from the dress to decorations and extra special touches. I’ve collected 27 of them below (I just couldn’t cut it down to 25! ), listed in alphabetical order. Turn to these sites for creative inspiration for the big day. But be careful: you may find yourself getting lost in the beauty of it all. Japanese Beadwork with Sonoko Nozue: preview photos and project PDF! Japanese Beadwork with Sonoko Nozue presents 25 jewelry designs by the fabulous and respected Tokyo-born teacher, all taught in the Japanese style of beading. Sonoko was the first foreign instructor at Bead&Button — in 2005 — and her presence each year draws crowds and “oohs” and “aahs” of excitement. She is a star of the beading world — and we mean “world” quite literally here. This new book takes her Japanese book Mode de Beads, which included instructions for nine projects, translates them, and adds instructions for 16 more jewelry designs by Sonoko, for 25 total — all in English, of course, and with a gallery of other beadwork from the author completing this magical book. Japanese Beadwork with Sonoko Nozue is an April 2012 publication; ask for this gorgeous, inspiring beading release at your local bead store or bookstore, or order it online on Amazon or BN.com. We invite you to sample the book: Click here to download a PDF of the Crystal Rose necklace project from the book, plus enjoy a taste of the projects in it pictured below. If you’re intrigued, tell us so, and then share the link on Facebook, Pinterest, Twitter, and StumbleUpon. Please join Lark Jewelry & Beading on Facebook, too, and we invite you to visit Sonoko’s website — which is in Japanese, of course! This is me making a mug. I make a lot of mugs. My name is Thom, and I’m excited to introduce myself as the new ceramics editor and point person at Lark. I was hired by Lark a little over a year ago, shortly after I moved to Asheville. Before that I lived in New York, where I worked a few blocks from Central Park for the craft book division of Random House. I didn’t expect to continue to work in book publishing when I returned to the south. At least not in a full-time kind of way. But as luck would have it, Lark needed help on their needlearts team just as I was moving. I jumped at the chance. As a lifelong potter, I knew and respected Lark’s publishing program. And I was more than happy to make books for fellow makers, even if it wasn’t the ceramics books. As of now, we have spun off a new, dedicated Facebook page for Lark Ceramics. Drop by and say hi! We’ll give you some incentives to “like” us as well. What kind of incentives? How about posting calls for entry for the ceramics books. Not enough? We’ll also create some themed photo galleries and such. What more could you want? Seriously, let me know and we’ll make it happen if Facebook allows it. With some time, I hope it will end up as fun of a ceramics Facebook page as a Facebook page can be. I will be attending NCECA in Seattle at the end of March. We haven’t finalized the details yet, but I will try to wear a Lark button or hat or something to make me easy to spot. Once we have the details worked out, I’ll post them on our Facebook page. I look forward to meeting our authors, readers, and everyone else in the ceramics world–whether it’s in person or just online. Let’s make things together. Sharing the Joy of Socks! What better way to spice up your socks life than with a new pair of hand-knit lovelies? Or maybe you want to show someone special you really care this Valentine’s Day? Either way, the Joy of Socks kit can take you there with 30+ masterful sock designs, a set of 5 double-pointed needles, two skeins of superwash merino yarn, and plenty of giggles along the way. To enter to win the Joy of Socks book and kit, please leave a comment on this post by 9 p.m. EST on Thursday, February 2nd. Any comment is fine—though we’d love to hear what crafty things you’re making – or planning to make – for Valentine’s day. Three winners will be selected at random from among all eligible entries and notified by Friday, February 3rd. Click here for the official rules. This giveaway is now closed to new entries. Thanks to everyone who left a comment. The winners will be announced shortly! Our team was talking a couple weeks ago about winter-themed ideas for the blog. The color white. Soup. Valentines. Snow. Weddings. Snow sculptures. The list went on. Then a couple days later I read a blog post about how nice it can be to see pops of bright color amid all the grey and white of winter. That same day I started seeing it everywhere I looked. And not only online. I walked into Target and they had new neon accessories front and center. There must be something to the psychology of it all…a measurable effect of bright green, pink, and orange. If you want to find out more about Pinterest, check out my previous Pinterest post or head over to Pinterest’s site. Here’s a pretty Valentine that you can easily customize. Use it as a framing device for a favorite photo of your friend or sweetie. It would make a great gift tag too. Download it here. Why not list all the things you love about your sweetheart or friend in this charming hand-drawn Valentine? Or whip up a special menu for that meal you’ll cook for your Valentine. You can give it to them in advance or position it, just so, as a charming table setting. Download is here. These antique images are from Memories of a Lifetime: Romantic Illustrations — one of a series of books that comes with a CD so that you can download and print the artwork that speaks to you. And what you do with it is up to you! Card making, artful journaling, scrapbooking, fabric transfer; the possibilities are endless. Sabine Lippert’s Beaded Fantasies: preview a project PDF of Les Fleurs Necklace! We’re so pleased to be releasing this publishing season the first book in English from German beading superstar Sabine Lippert. Sabine is a relentlessly prolific beader and endlessly imaginative designer, as well as a social media force to be reckoned with and loved. Simply put, she is one of the most popular beaders in Germany, in Europe, in the United States, and in the world. You can read my comprehensive interview with Sabine on this blog from mid 2010. 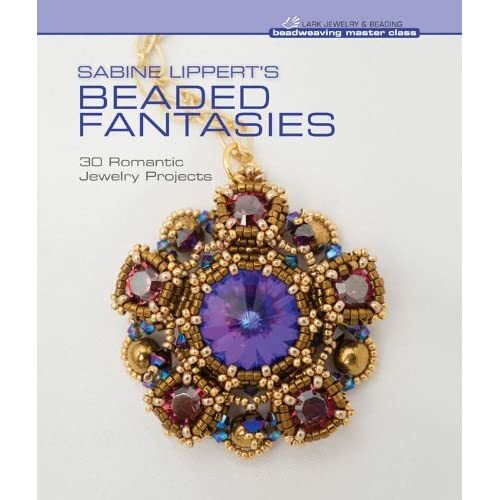 Sabine Lippert’s Beaded Fantasies presents 30 of Sabine’s jewelry designs; all the projects utilize peyote or right angle weave, beading’s most popular stitches. The book includes plenty of beautiful photography, excellent instructions and how-to illustrations, a special chapter by Sabine about how she approaches design, and a gallery of photographs of beadwork Sabine admires. See the full table of contents at the bottom of this post. The book will officially publish on May 1. Ask your local bead store or bookstore to carry it, or you can order the book online at Amazon.com or BN.com. In the meantime, let’s give you a taste of it: Click here to download a PDF of the project Les Fleurs Necklace from Sabine Lippert’s Beaded Fantasies. If you look at the PDF, you’ll see we’ve included the book’s table of contents, which has teaser photos from throughout the book. Sabine’s book is another outstanding release in Lark Jewelry & Beading’s Beadweaving Master Class series, joining books by Diane Fitzgerald, Marcia DeCoster, Laura McCabe, Sherry Serafini, Maggie Meister, Rachel Nelson-Smith, and a Sonoko Nozue book also releasing this spring, all forming an essential library of beautiful books for beaders. You can learn more about Sabine Lippert on her blog or her website, which are in both German and English. And then, please pass along this post: Share it, Tweet it, Pin it, and StumbleUpon it, and be sure to join Lark Jewelry & Beading on Facebook, as well. Thank you!